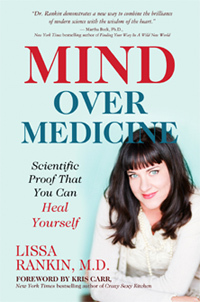 Mind Over Medicine is a New York Times bestseller and has been translated into over twenty languages. In the final section of the book, you’ll be introduced to a radical new wellness model based on Dr. Rankin’s scientific findings. Her unique six-step program will help you uncover where things might be out of whack in your life—spiritually, creatively, environmentally, nutritionally, and in your professional and personal relationships—so that you can create a customized treatment plan aimed at bolstering these health-promoting pieces of your life. You’ll learn how to listen to your body’s “whispers” before they turn to life-threatening “screams” that can be prevented with proper self-care, and you’ll learn how to trust your inner guidance when making decisions about your health and your life.